and reveal our true potential. and move forward. Never lose hope. that you can’t possibly imagine. “You can dance in the storm. because it might take too long. You can can do it now. or who they could be. and know it in all its pleasure and its pain. by saying ‘Yes’ to the potential of the moment. for the moments add up and become your life. Every moment has a choice. Make choices that empower and help you. 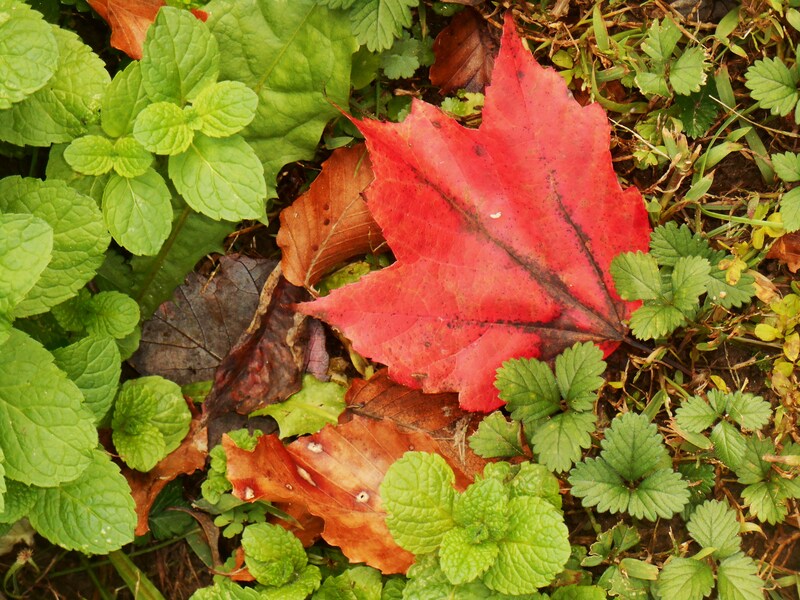 Have you noticed that certain colors predominate in the landscape each month? August here is always very green. January is a study in brownish grey. April is awash with Azalea pinks and reds. 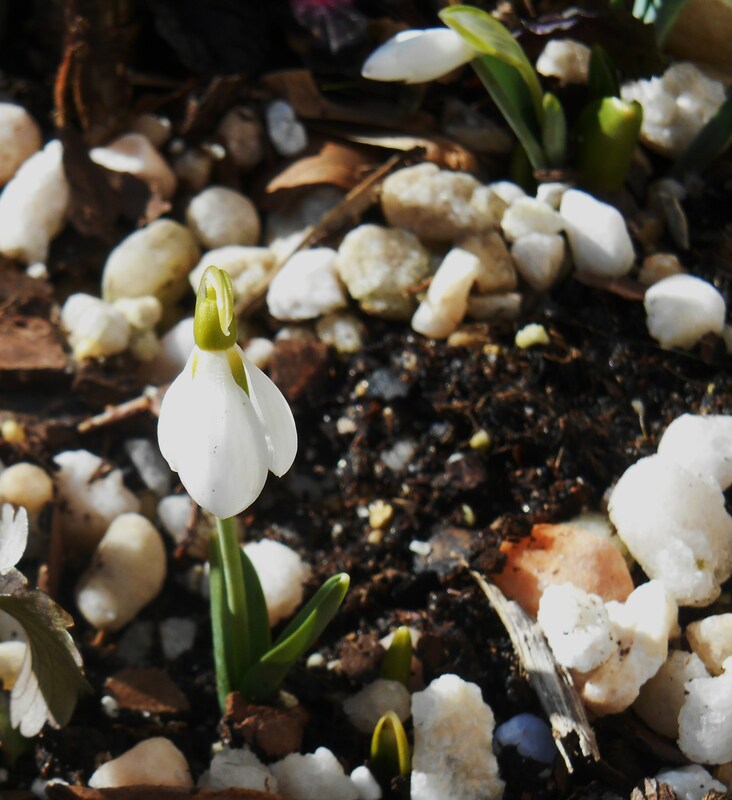 Yes, there are white snowdrops and rosy Hellebores in our garden now. 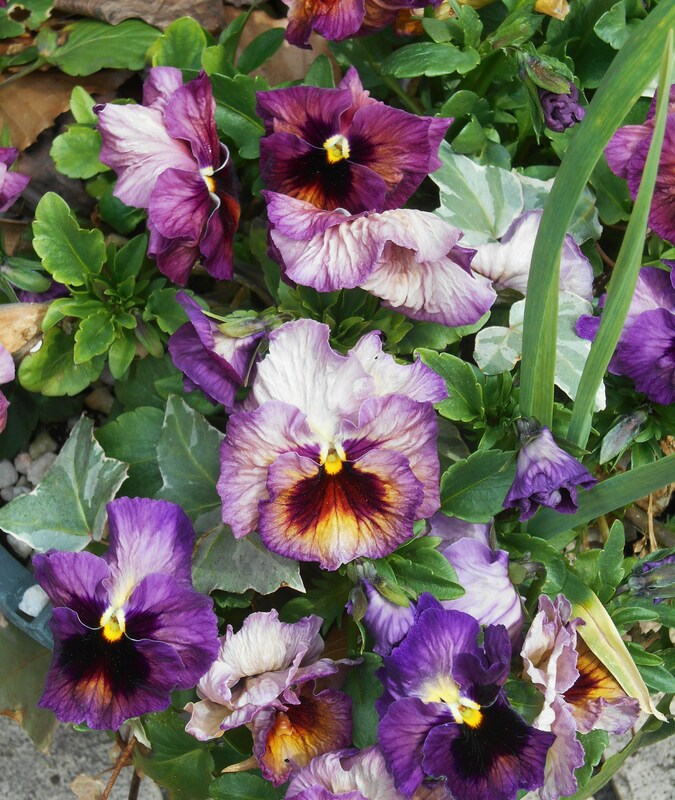 Purple and blue Violas bloom in pots and baskets. Mahonia aquifolium, blooming through our winter, provides nectar for early pollinators. 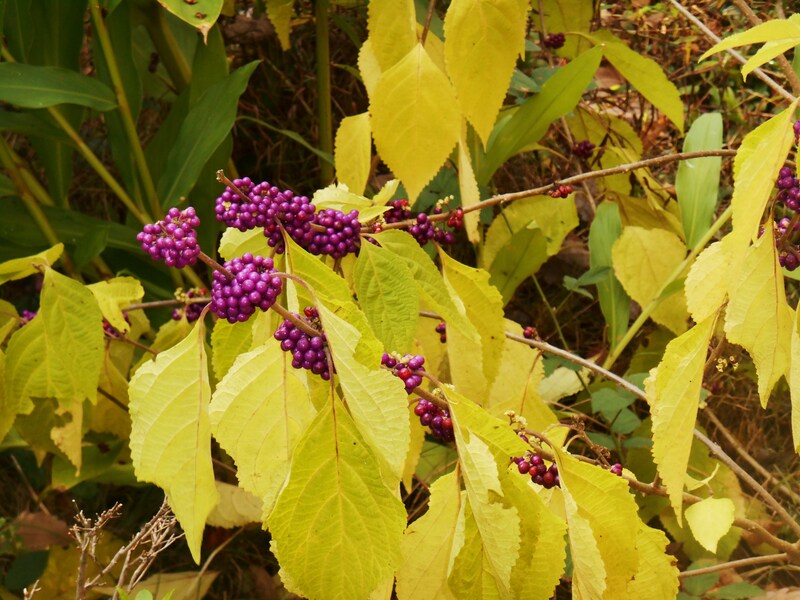 By summer each flower will have grown into a plump purple berry, loved by our birds. 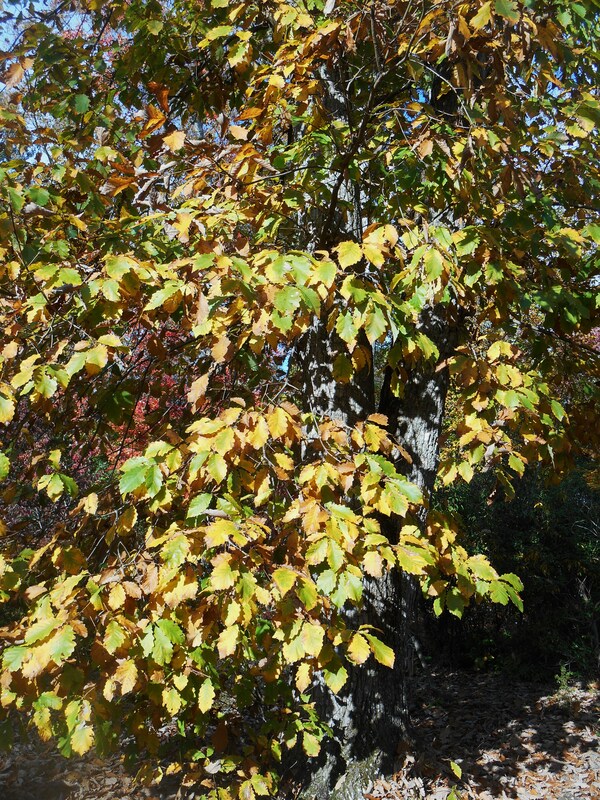 These tough shrubs, native to western North America, have naturalized across much of Virginia. But the flowers highlighting our garden now, blooming fiercely against a still wintery brown backdrop; are the first golden Daffodils of spring, showering cascades of yellow Mahonia flowers, the occasional sunshiny Dandelion, and hundreds of thousands of yellow Forsythia buds. 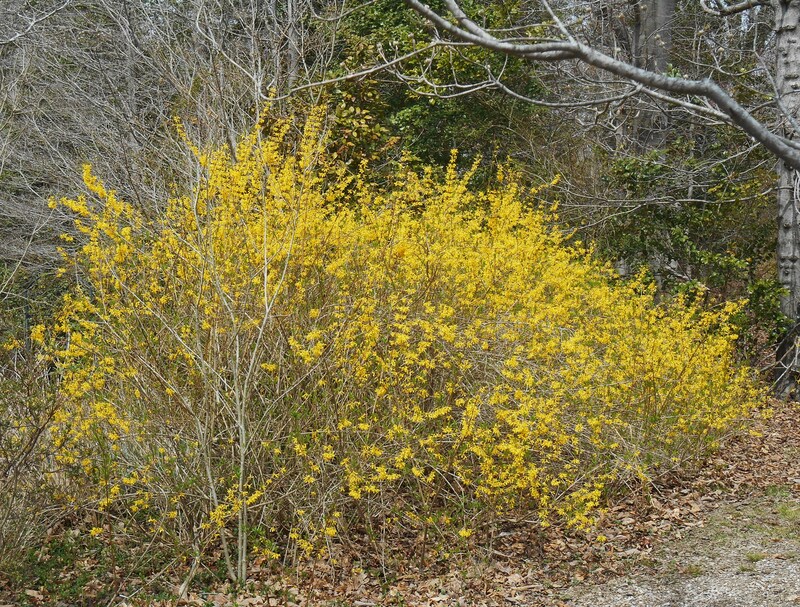 Forsythia greets each spring with thousands of tiny yellow flowers. 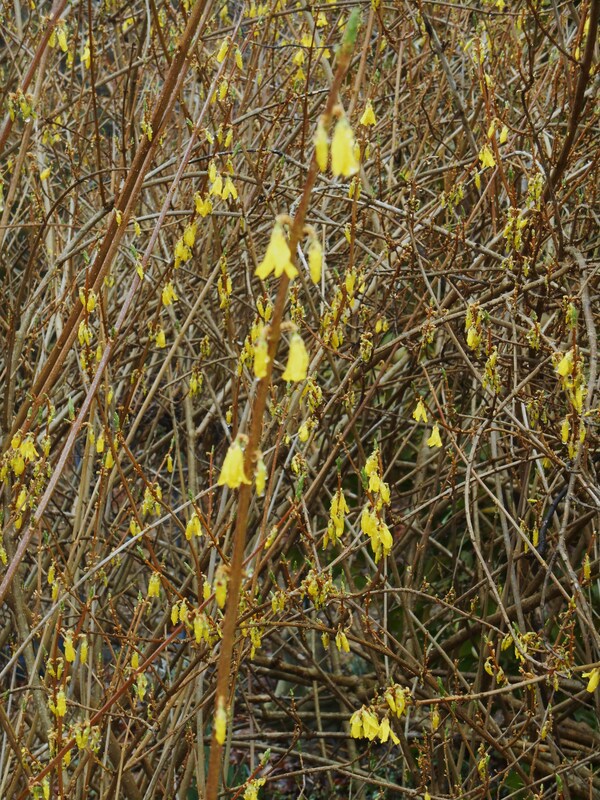 An Asian native, Forsythia naturalized in North America more than a century ago. An important source of nectar, these large, suckering shrubs provide shelter for many species of birds and insects. Forsythia and Daffodils line many of our public roads, too. 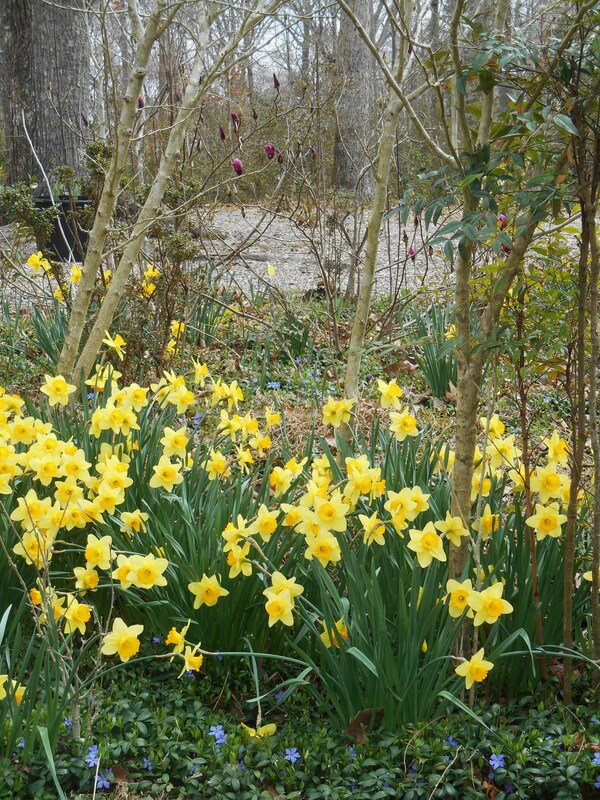 We found a huge stand of blooming yellow Daffodils in the median of Jamestown Road, near the ferry, last week. 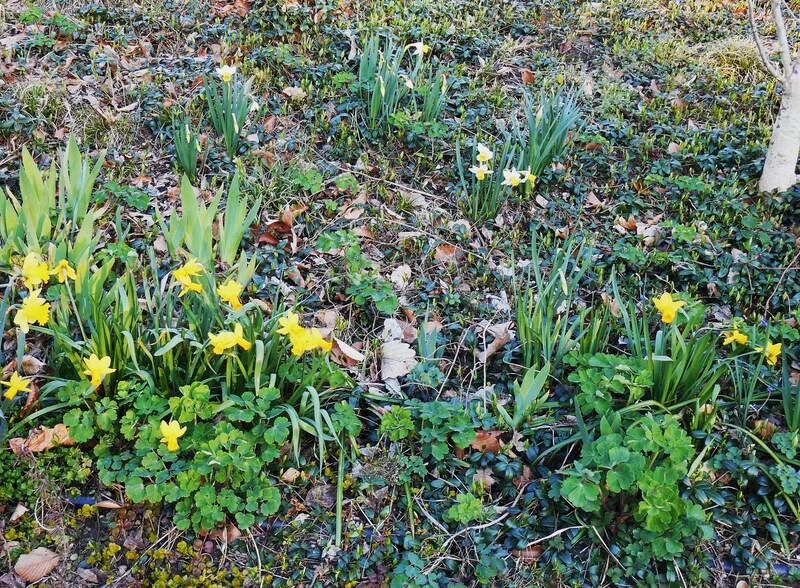 Their cheerful promise of spring feels almost defiant as we weather the last few weeks of a Virginia winter. 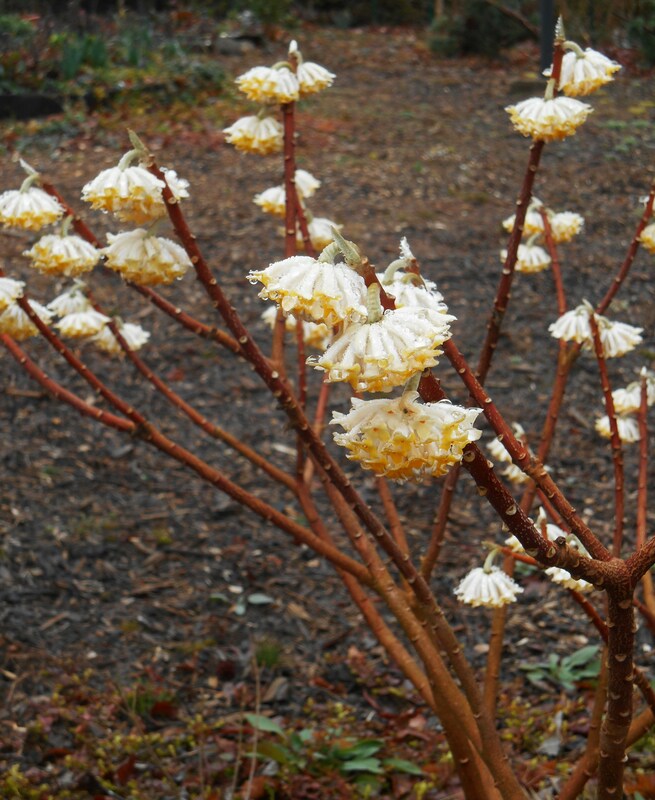 Edgeworthia chrysantha, or Chinese Paperbush, fills our front garden with fragrance now that its blossoms have opened. 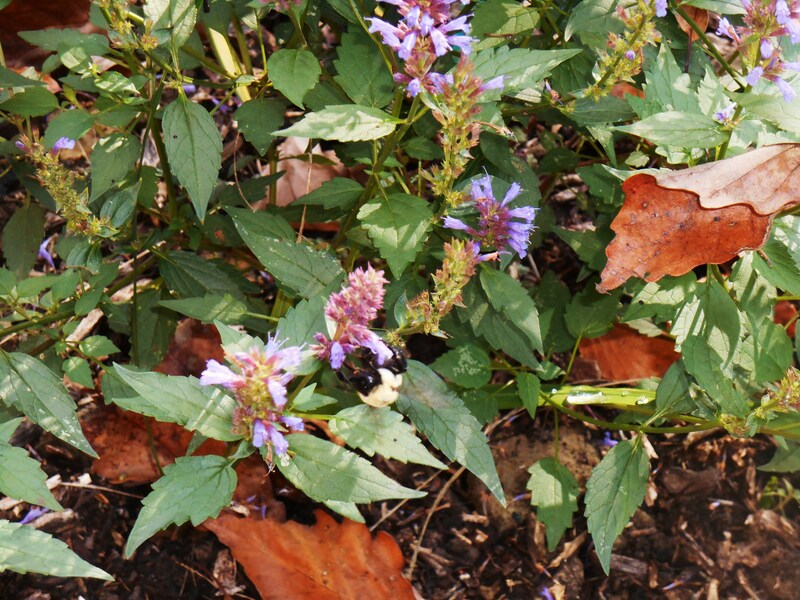 We found happy bees feeding on these flowers on Sunday afternoon. 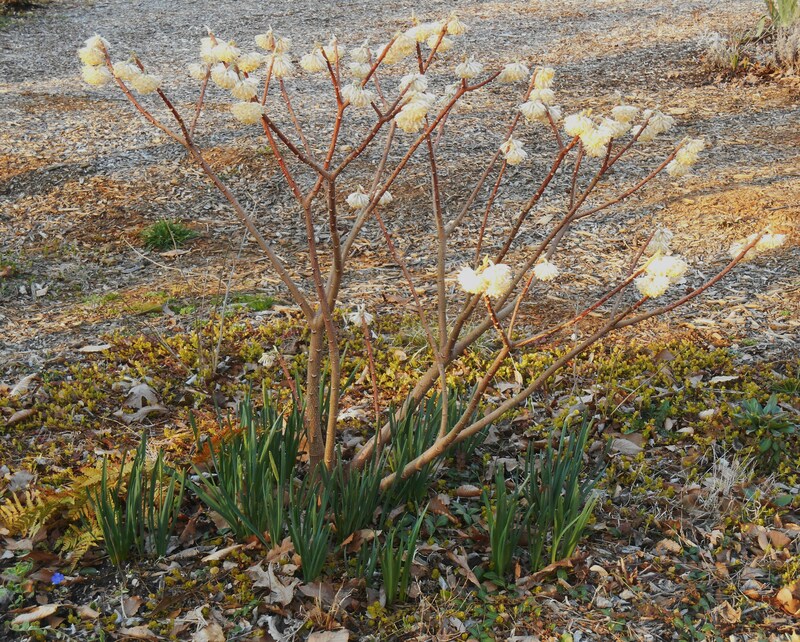 Touches of gold may also be found in the bright stamens of Hellebores, the warm centers of Edgeworthia flowers, and the bright Crocus which will bloom any day now. 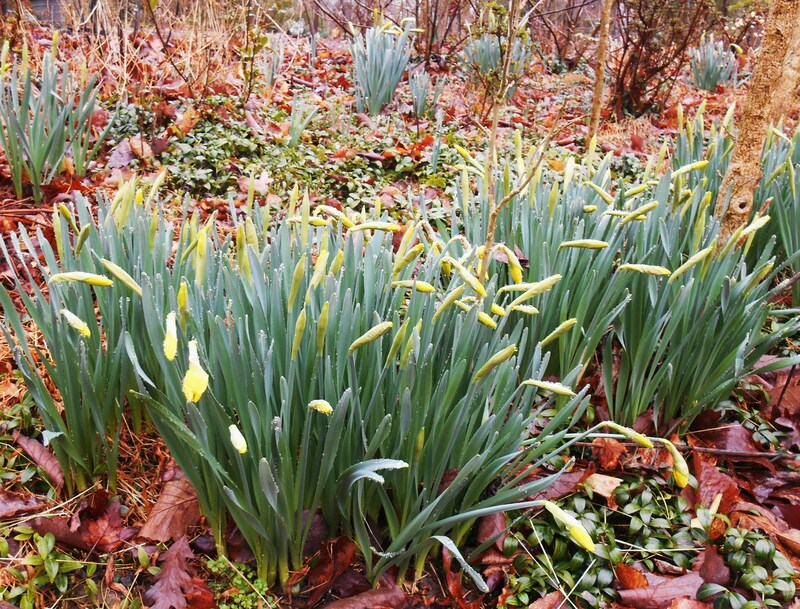 These golden flowers of February prove a perfect foil to bare trees, fallen leaves and late winter storms. What a lovely way for our garden to awaken to spring. Do you know anyone whose favorite color is brown? Can’t say that I do, either…. 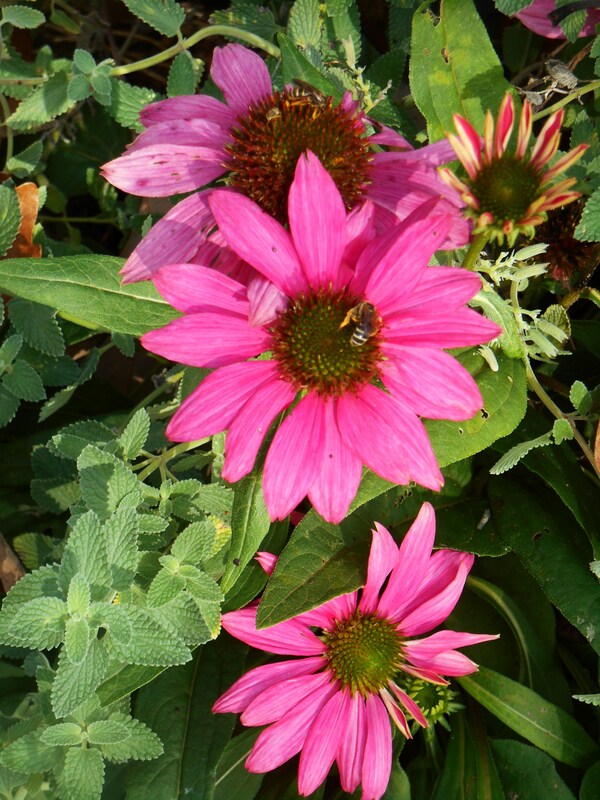 We gardeners often remain partial to green, or possibly to colors in our favorite flowers. But brown? Why not? We certainly look at it for much of the year! Brown is woody skeletons of trees, fallen leaves, peat, seeds, mushrooms, stems, and the debris waiting for me to clear from perennial beds. But brown is also rotten apples, faded flowers, insects, compost, bare Earth. Brown generally presents a challenge. It invites effort. It signals something coming or going in the garden. But I am at least at peace with brown. I wear khaki shirts and skirts and brown leather belts. We love polished wooden furniture, rattan, and hardwood floors. Brown can be restful when polished up, and made useful. Brown colors our garden today. Sodden mulch, rotting leaves, bare stems, and wet trees dominate the picture. But oh, when those brown stems pop open to release a flower, what delight! Brown is the color of pure potential, and holds its own silent promise. Inspiration waits everywhere; especially in a good gardening magazine. Particularly inspiring is the article ‘Beautiful Bouquets’ in the current special edition Plant Issue of Gardens Illustrated magazine. Plantswoman Anne Townley suggests delicious combinations of plants one might grow together, expecting to later cut them for beautiful and unusual bouquets. Clockwise from top left: Ivy, Violas, Edgeworthia, Lavender, Artemesia, Iris, Mahonia, Fennel, Black Eyed Susan. 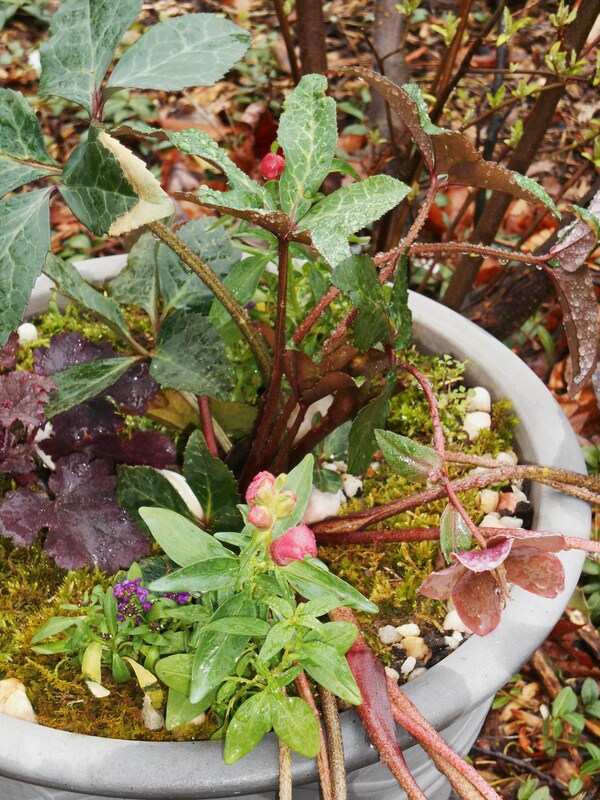 Her plant choices are quite idiosyncratic, at least to this Virginian gardener. The photography for this article was my inspiration, however. Photographer Andrew Montgomery created a stunning tableau with each combination of plants Ms. Townley selected. Please follow the link to see these artful vignettes of petal and leaf composed to illustrate this lively article about cutting gardens. Clockwise from top left: Camellia, Viola, Pineapple Sage, Camellia, Cyclamen, Viola, Edgeworthia, Ivy, Rose, Salvia, Hellebore, Pineapple Mint, scented Pelargonium. Emulation remains the highest form of flattery, and so I couldn’t resist assembling a little tableau of my own this morning from what looks fresh in our garden today. Part scavenger hunt, part journey of discovery; what a surprisingly diverse collection of leaf and flower waited for me in the garden! Wandering, cutting and arranging, I quickly realized that most of these bits of horticultural beauty would have grown unnoticed save for this challenge. Clockwise from top left: Rosa, ‘The Generous Gardener,’ Ivy, Viola, Black Eyed Susan, Rose hips, Mahonia, Fennel, Iris. 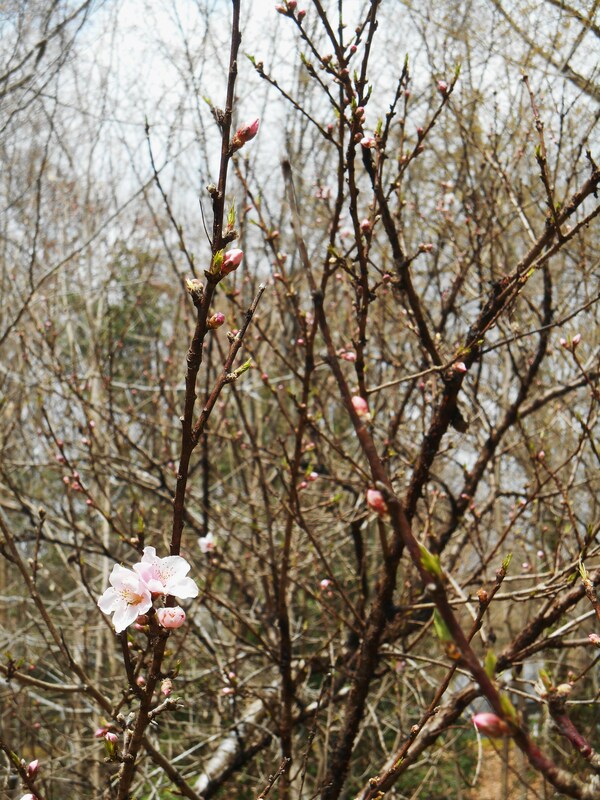 Each newly snipped blossom and leaf delighted me. Though cut from many different areas of the garden, from pots, beds and shrubs; they harmonize. What a helpful way to get a ‘read’ on how well the plants in one’s garden go together. I could have just sat and admired this tray full of cuttings over a steamy cup of coffee. But, other projects called, like the bin filled with Brent and Becky’s bulbs, gleaned from their end of season clearance sale, just before the holiday. We had been granted another good day for planting, and so I didn’t tarry over the tray too long. Rather, I recut the stems and tucked them into a vase, floated the blossoms in a bowl, slipped the ivy into a jar of rooting cuttings, and headed back out to the garden. Because there were just one or two stems of each plant on the tray, this is a somewhat unusual vase. It needed photographing from all sides as each of its ‘faces’ is different. I am happy to join Cathy at Rambling In the Garden for her “In A Vase On Monday’ meme this week. She has created a ‘Moondance’ by the sea; more inspiration, as always! Although we are enjoying our little vase this afternoon, my partner and I remain intrigued by the possibilities of simply arranging stems on a tray. I plan to tour the garden, tray in hand, at some regular interval from here on just to see what there is to see. And, inspired by several excellent articles on garden color in Gardens Illustrated, I also took my bin of bulbs back out to the garden for a few happy hours of planting today. 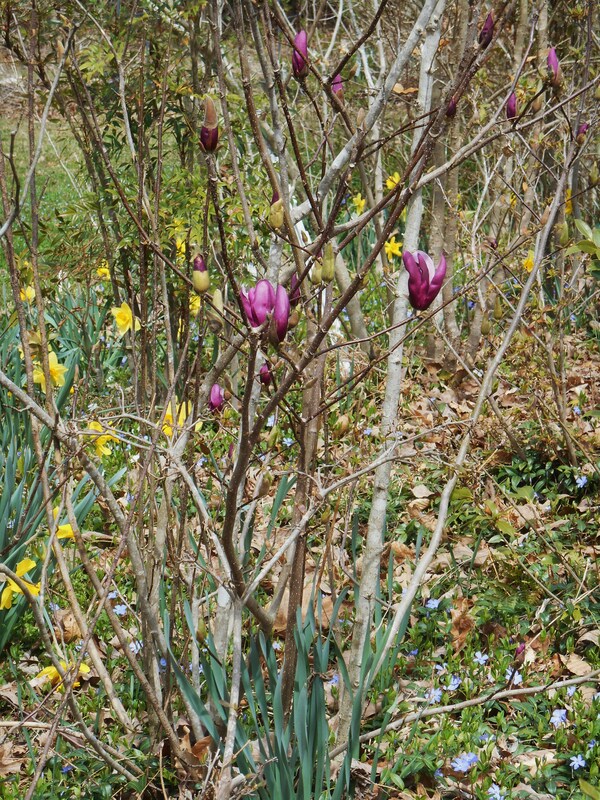 Bulbs planted a few weeks ago have already broken ground with their first, tentative leaves. Winter blooming Iris have started into growth in this pot with Violas and Moss. I dug new areas and planted Daffodils, Muscari, Leucojum, Cyclamen and more, before covering everything with a fresh coat of compost. Although imagination is a wonderful thing, I can’t wait to actually see these new additions grow into the tapestry of our garden in the months ahead. Fall never fails to fascinate with its outrageous color. Suddenly, the tired, dry world of late summer in reinvigorated by cooler nights, shorter days, and a bit of rain. And the world transforms itself yet again. Each day just grows better as the colors concentrate into the brightest possible hues. 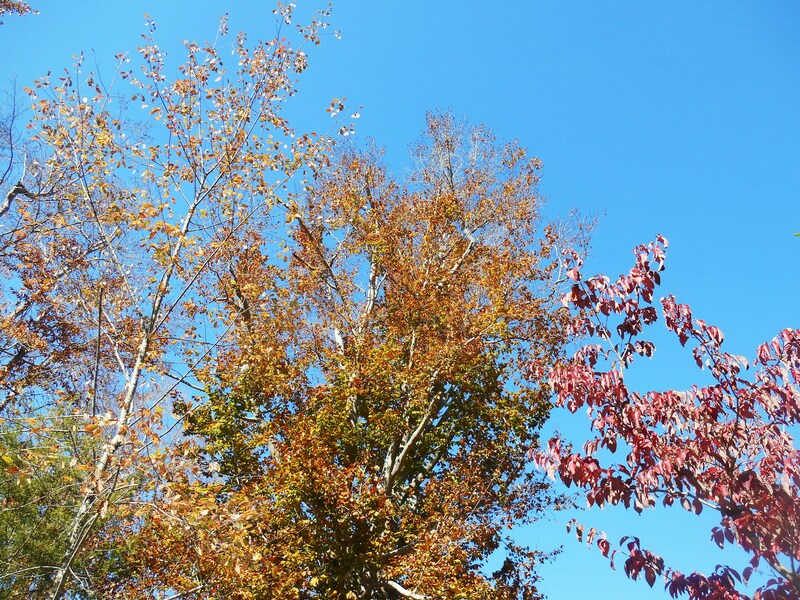 A cerulean sky floats above gold and bronze, scarlet and orange leaves of all shapes and descriptions. 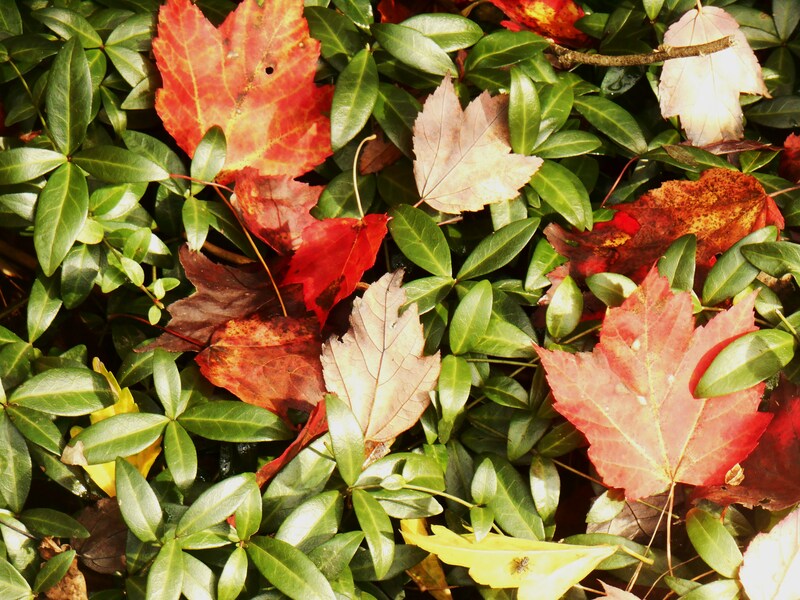 When the wind whispers even slightly, a shower of falling leaves gently let loose and dance their way to the ground. And there they lay in moist and colorful splendor, against an emerald green mix of grass and herbs, until they fade. We, too, float in that magical space of Indian Summer, here in Williamsburg this year. 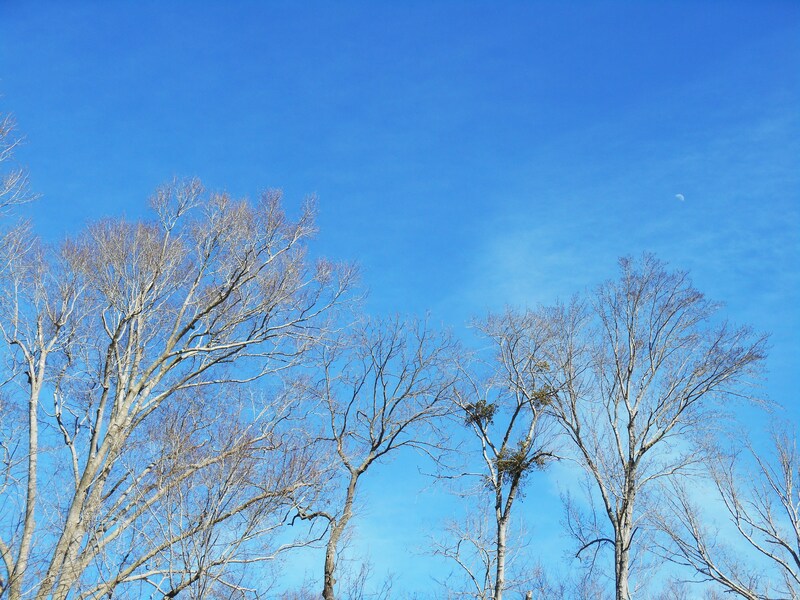 After morning rain, we enjoyed warm sunshine this afternoon. The golden late afternoon sun animated every petal and leaf in the garden. We had the slider to the deck open to enjoy the balmy, rain rinsed air. The cat and I enjoyed this chance to hear the birds just outside in the trees and smell the sweetness of autumn. 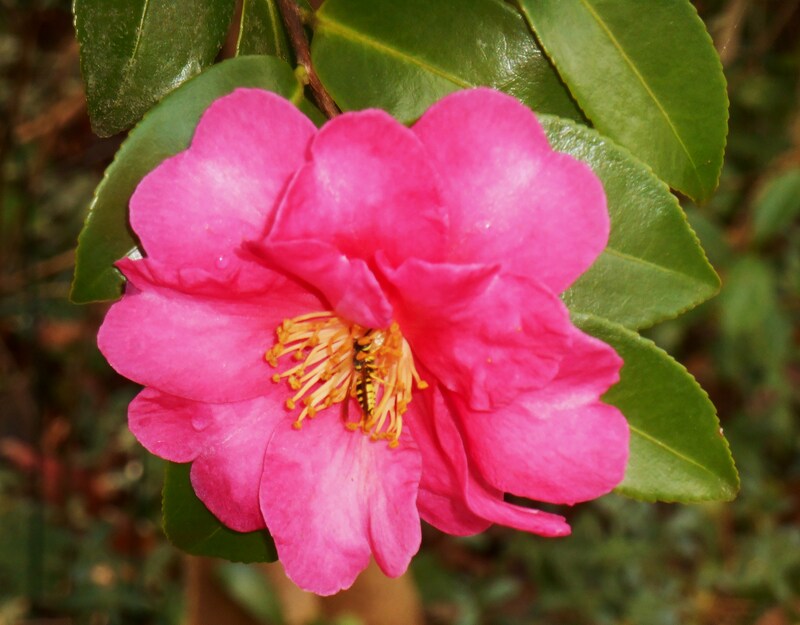 New flowers are opening daily on the Camellias. 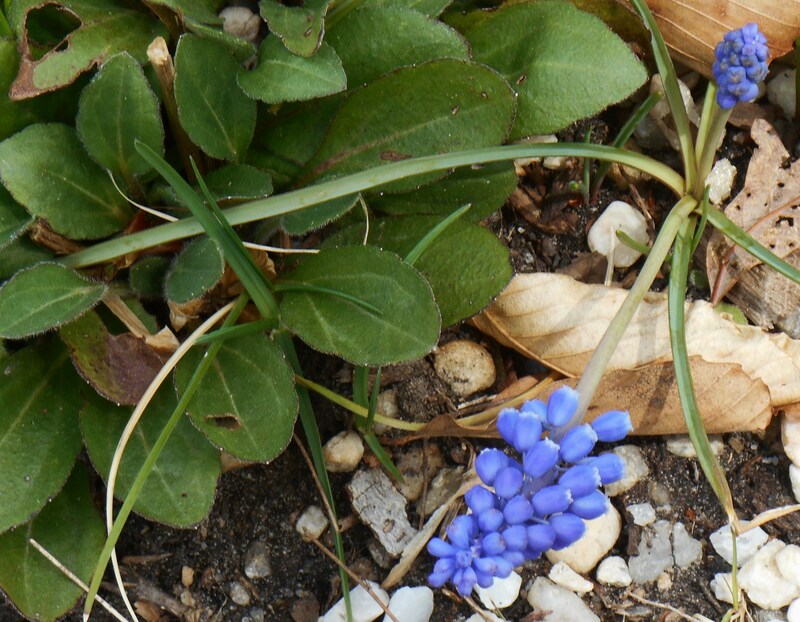 Even our perennials still bravely pump out buds, hoping this warmth will last. The hungry bees lap of each day’s nectar like the precious gift that it is. And we feast on the colors of autumn, changing daily, packing in every bit of beauty to our minds’ eyes, while they last. 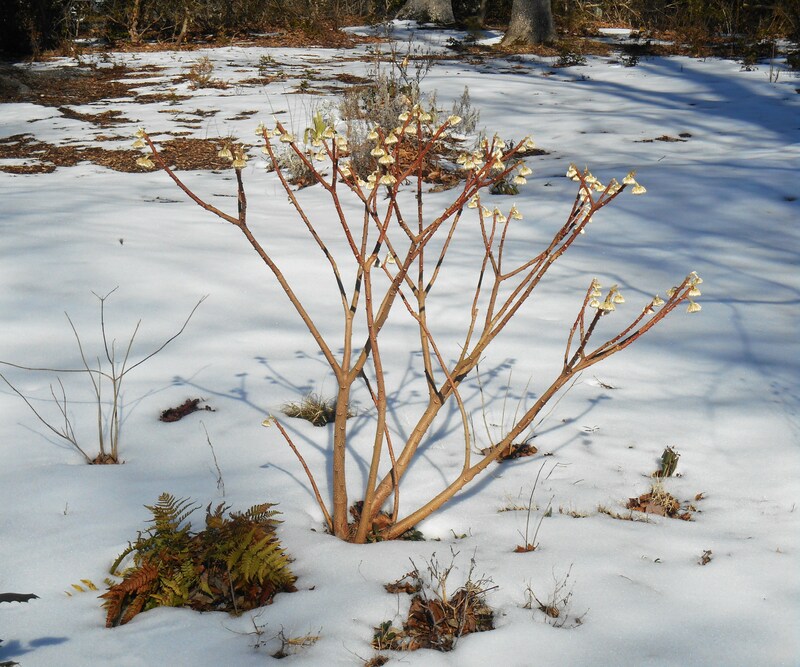 Winter’s buds have appeared on our Edgeworthia. Our garden grows golden today. Bright yellow Forsythia flowers explode from the bare branches which frame our driveway, line our front border, and grow as an impenetrable barrier on one corner of the garden. This is an ancient stand of Forsythia, planted decades ago by the original gardeners here. Towering over our heads, its brilliance lights up the entire garden when it blooms. Waves of golden daffodils punctuate the rolling hillside. 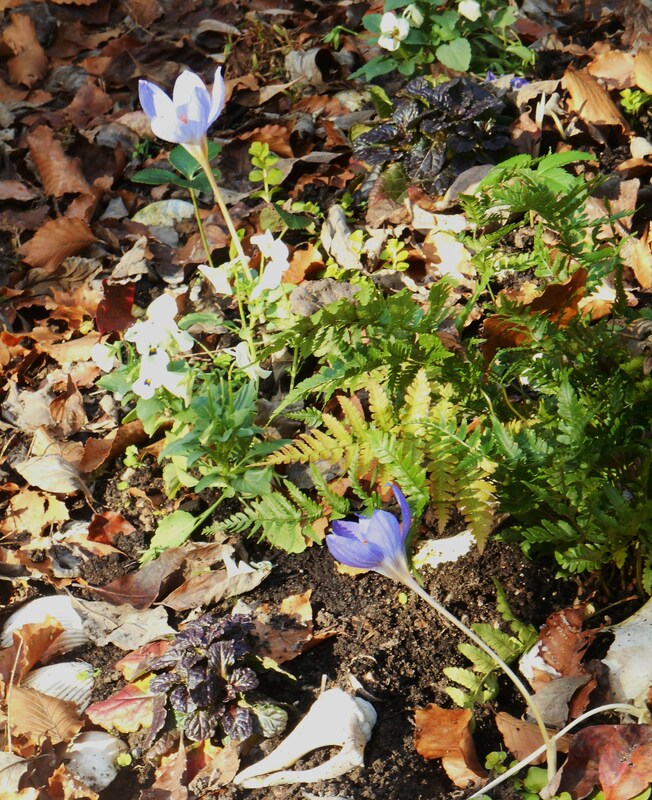 Although many have naturalized over the decades in large clumps, we have planted new bulbs every autumn since we came here. It is interesting to watch the clumps grow each year from a single stem to a thriving colony of bright flowers. 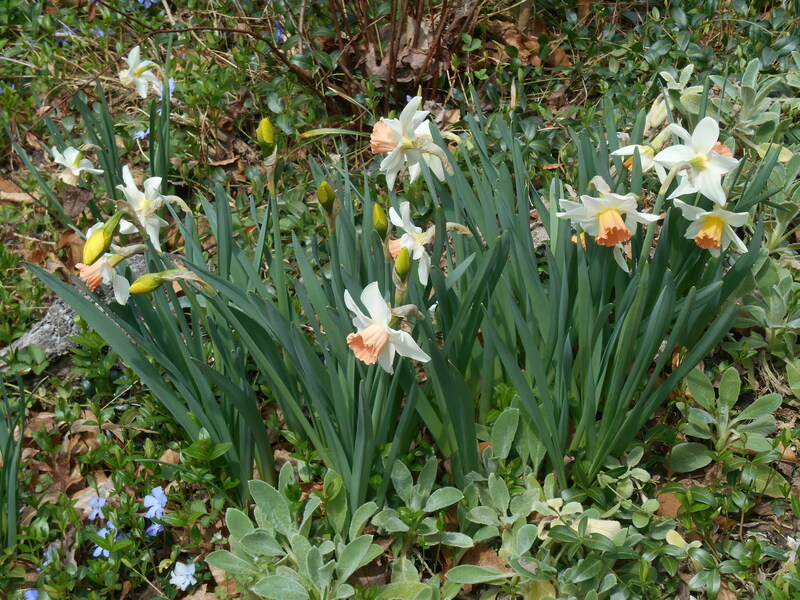 We are about at ‘mid-season’ now for daffodils, and we’ll enjoy them throughout April. We plan to drive up to Gloucester next week to visit the daffodil farm there, and perhaps select a few new varieties to plant this autumn coming. 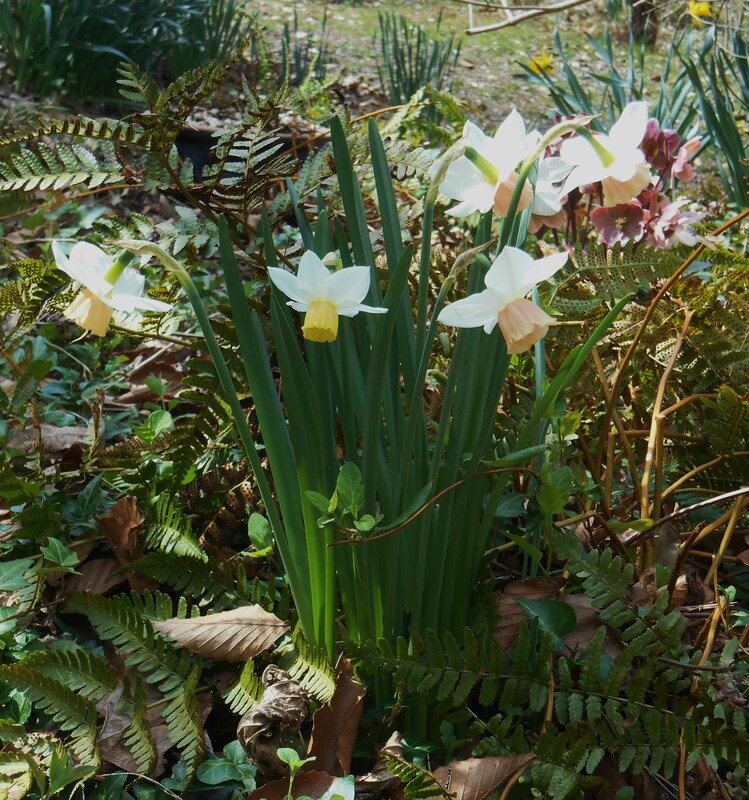 The daffodils bloomed even before the Muscari this spring. 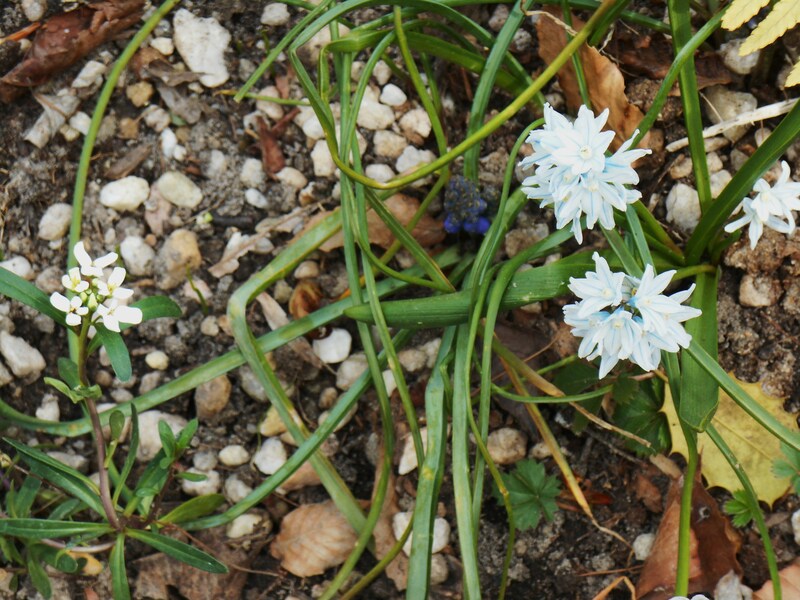 We have both white and blue ones blooming now. 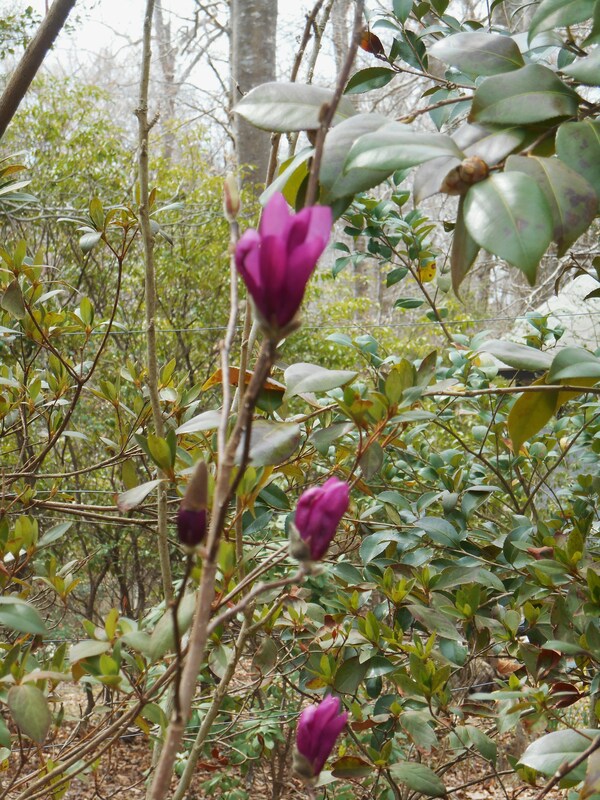 Our Magnolia liliflora ‘Nigra’ began to open yesterday in the afternoon’s warm sunshine. These were also planted by earlier gardeners here, much to our delight. Their dark purple flowers open slowly over several weeks in spring, and often return at the end of summer for a second time. 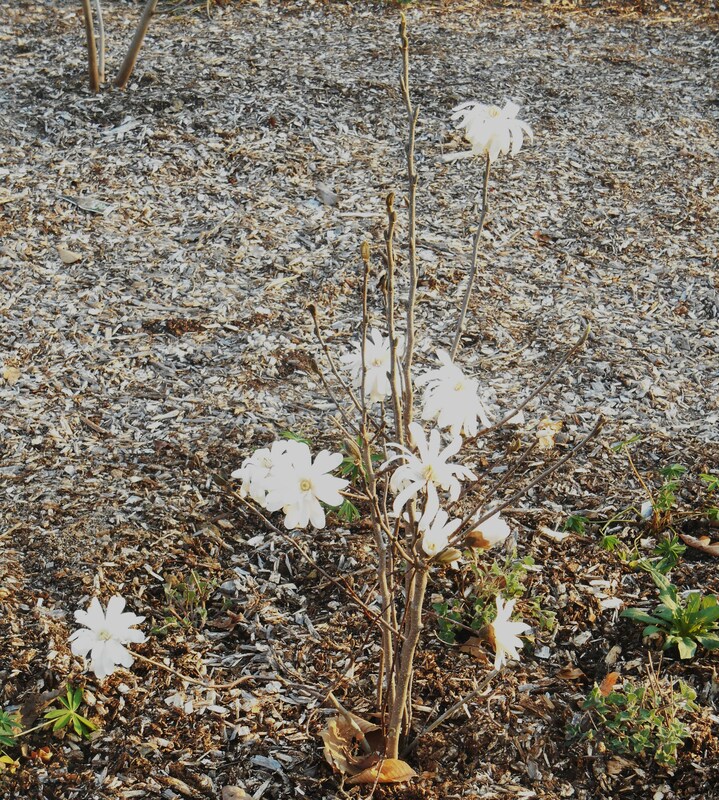 We planted a Magnolia stellata this week, covered in buds. 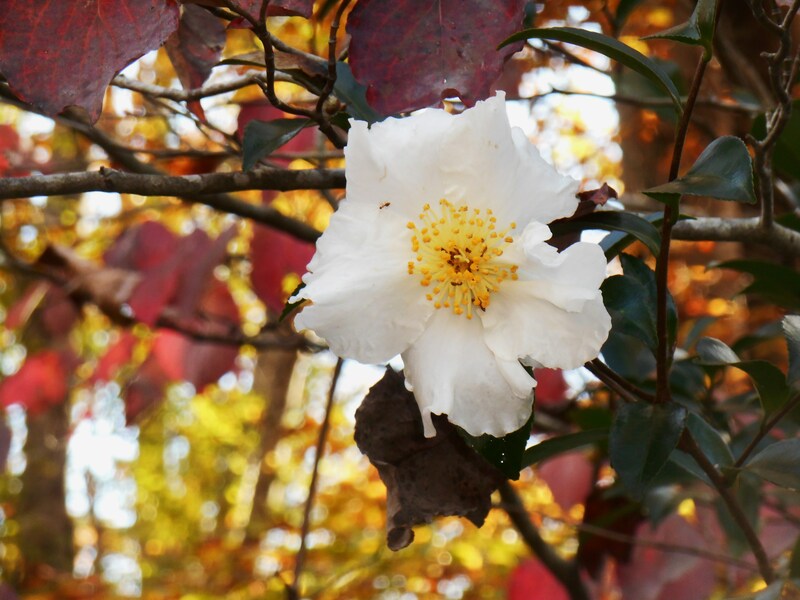 While one might expect a white shrub to get lost in our woods, it shines like a beacon. I can only imagine how lovely it will be in a few year’s time when it has grown up. Trees have burst into bloom in the back garden. 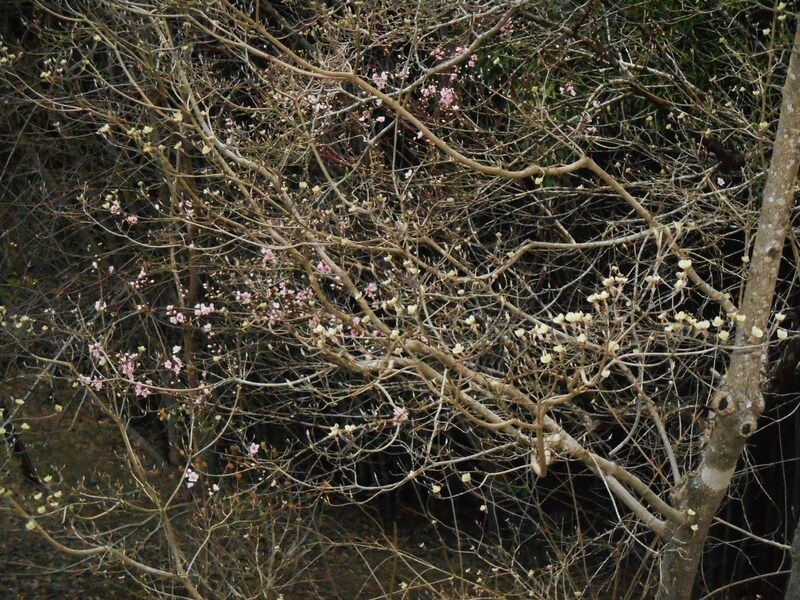 The peach blossoms began to open overnight, and the apple and pear showed their first color late in the afternoon yesterday. This is that magical time when our entire garden bursts into bloom. 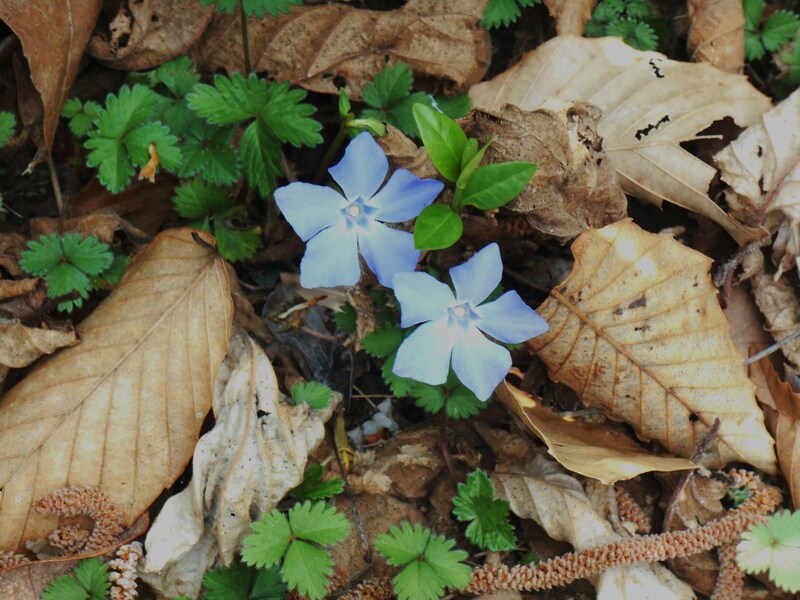 All of the Vinca vines cover themselves in tiny periwinkle flowers, opening a few more each day. These spread themselves all around the garden, wherever there is a bit of bare ground. 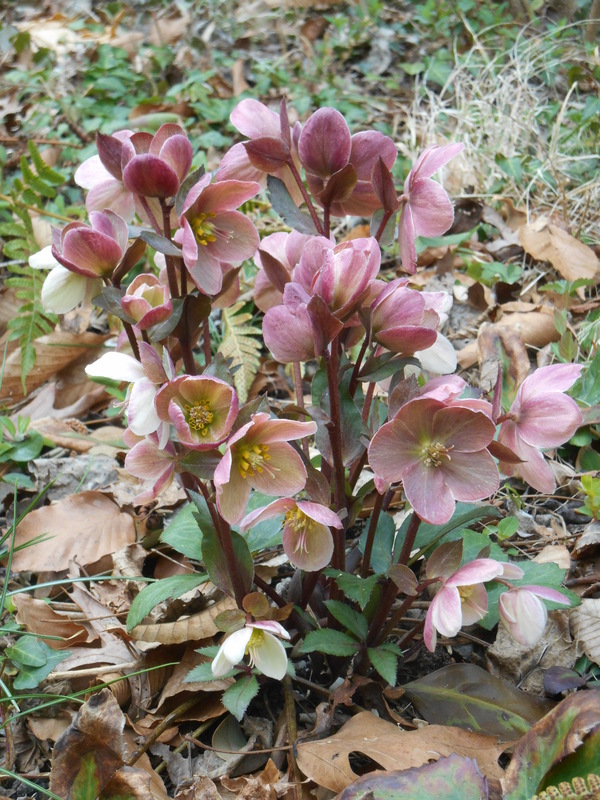 And all of the Hellebores are blooming now in various shades of burgundy, pink, mauve, and white. Even several planted out as tiny seedlings last spring have matured enough to flower. 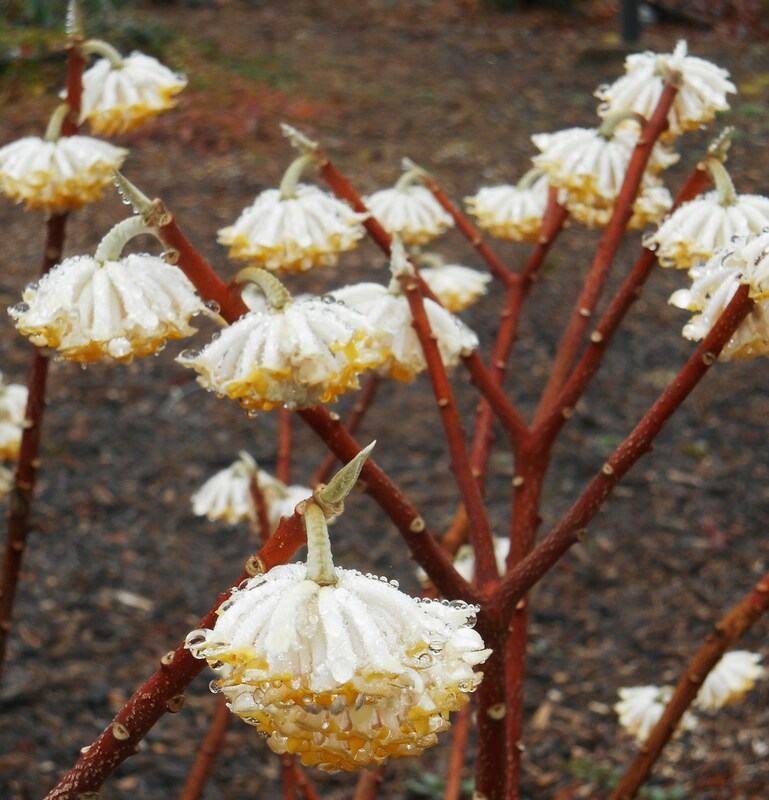 The Edgeworthia continues to get better, sweetly fragrant and tipped in golden yellow. 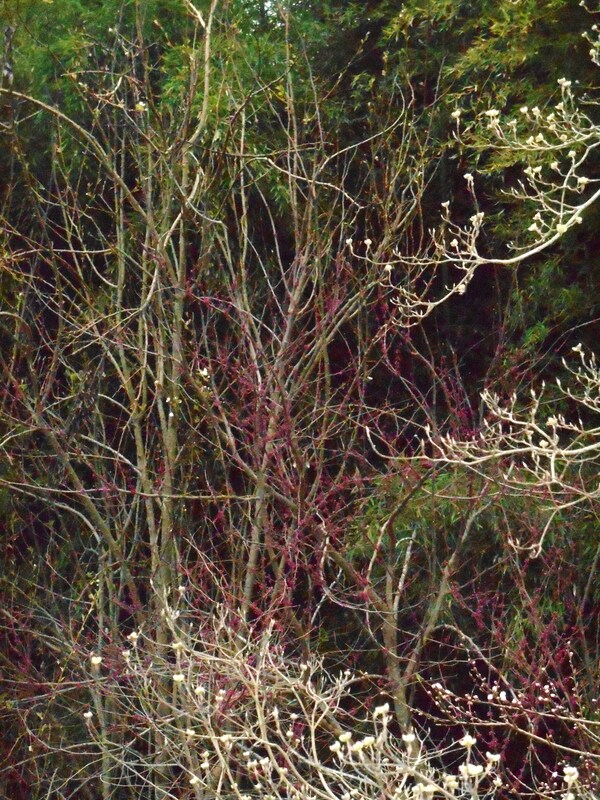 Lilac shrubs stand full of buds. Violas in pots have taken courage from the softer weather to grow again and cover themselves in flowers. Even the Camellia japonica buds are opening to release their thick, waxy petals into the warmth of April. I hope you can feel the warmth and smell the sweetness of our spring breezes this evening. Each day, we become more aware of that fourth dimension in which we move: time. Some days time slows down and allows us to savor time spent enjoying the company of friends. An hour stretches out into a long, languorous visit of good conversation and laughter. Other days, hours seem to evaporate into nothingness as we clean out beds, plant, prune, and plan what will go where this spring…. The world is full of miracles and wonders. 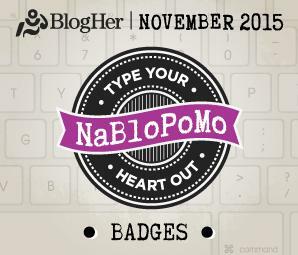 Fresh: new, different, out of the ordinary…. A perfect theme for this opening of a new season. The world is freshly washed in crystal clear raindrops. Fresh flowers finally opened in the garden. as we hover now on the cusp of spring. The Daily Post challenges photographers to show something which is fresh. I can remember times, when I was still teaching, when I would lie awake at night wishing for a snow day. School kids have more in common with their teachers, sometimes, than they may realize! Everyone needs a break from their routine from time to time. And everyone I know is wishing now for a break from the snow. But that break is still down the road and over the weather horizon. Another storm moves in tonight. We have restocked on the essentials: coffee, cream, and cat litter. Snow remains a welcome sight in the winter garden. 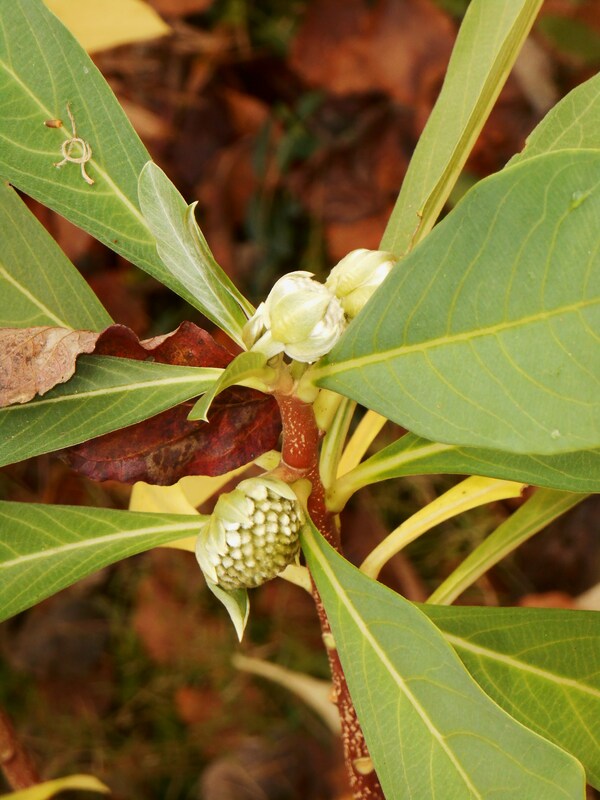 Beyond it’s beauty, it also insulates, hydrates, and provides the extended period of cold so many plants in our region require for spring growth. We may not think about it, but snow absolutely functions like a blanket on our garden beds and in our pots. 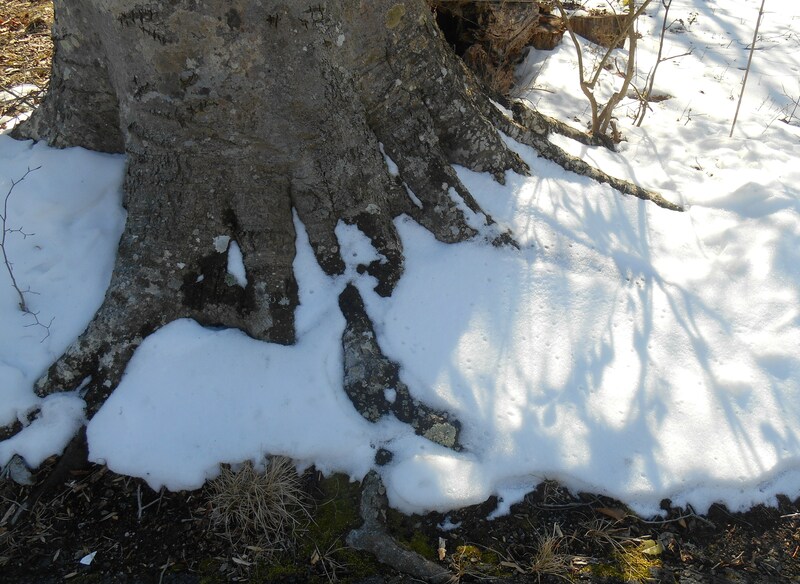 Deep snow protects roots, crowns and leaves from winter’s very dry and extremely cold winds. 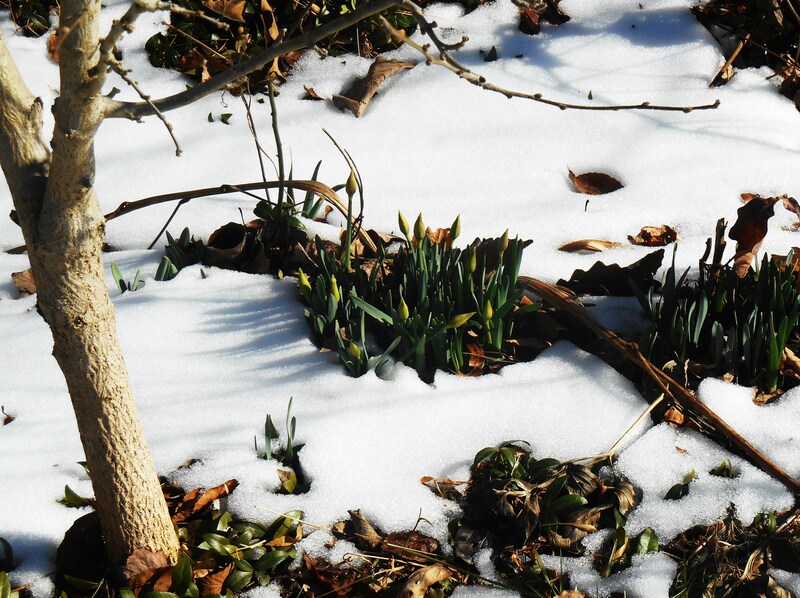 Snow insulates and protects sprouting bulbs and awakening perennials, helping them through these last weeks of winter. Like mulch, it helps maintain a more even soil temperature so plants don’t ‘heave’ up out of the ground during the freeze/thaw cycle. Our ground water is replenished from melting snow. But so are our potted plants. Plants can’t absorb water very well from frozen soil. 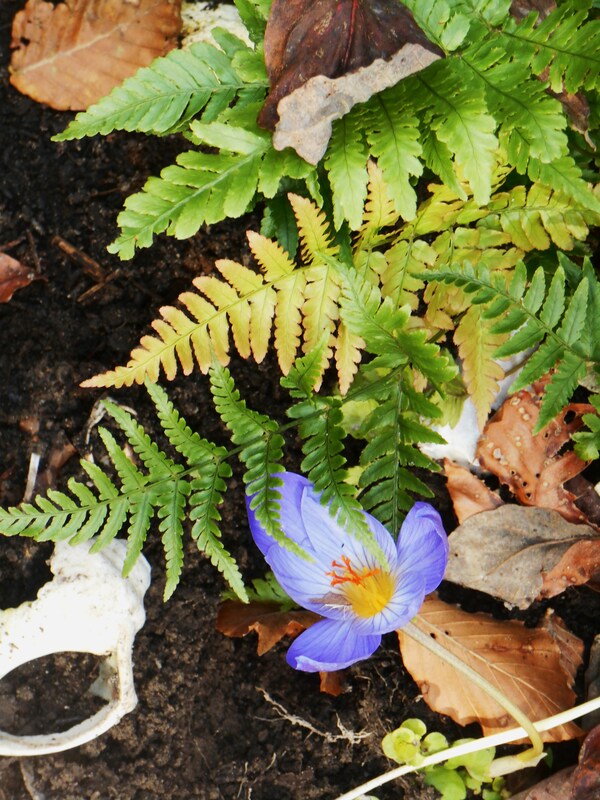 But melting snow waters plants and helps thaw out the soil when it melts in the mid-day sun. 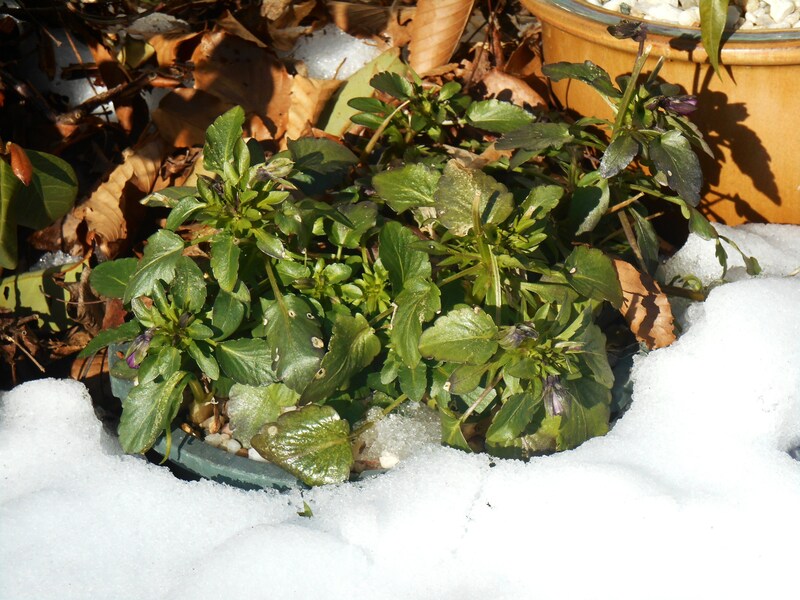 Without snow, hardy annuals and perennials living in pots through the winter may dehydrate on sunny days, especially when it is windy. 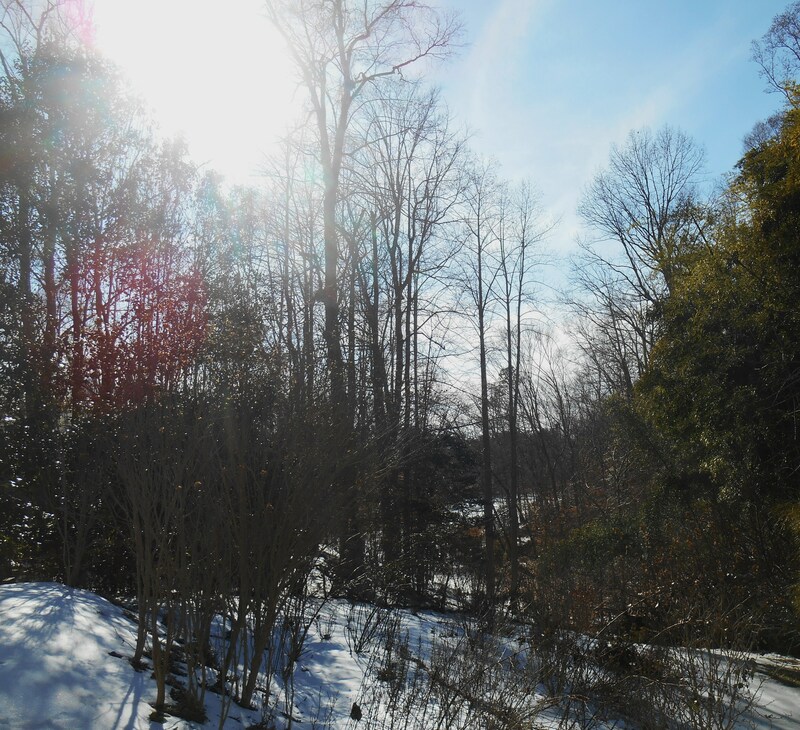 Snow cover helps certain fruit bearing trees, bulbs, and perennials maintain the periods of extended cold they need in order to grow. 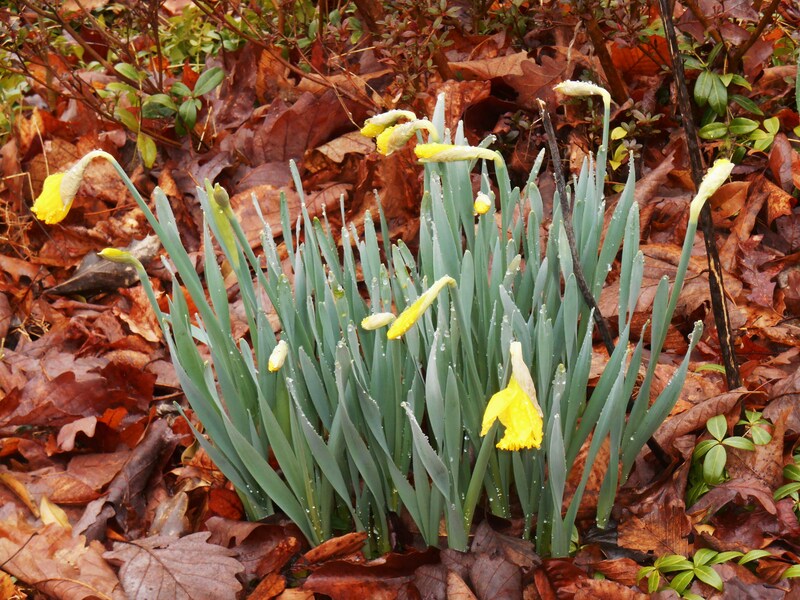 Gardeners in regions with gradually warming climates find that some plants no longer get their required ‘chilling hours.” This means replacing old reliable plants with different cultivars adapted to the warmer climate and fewer hours of freezing temperatures. 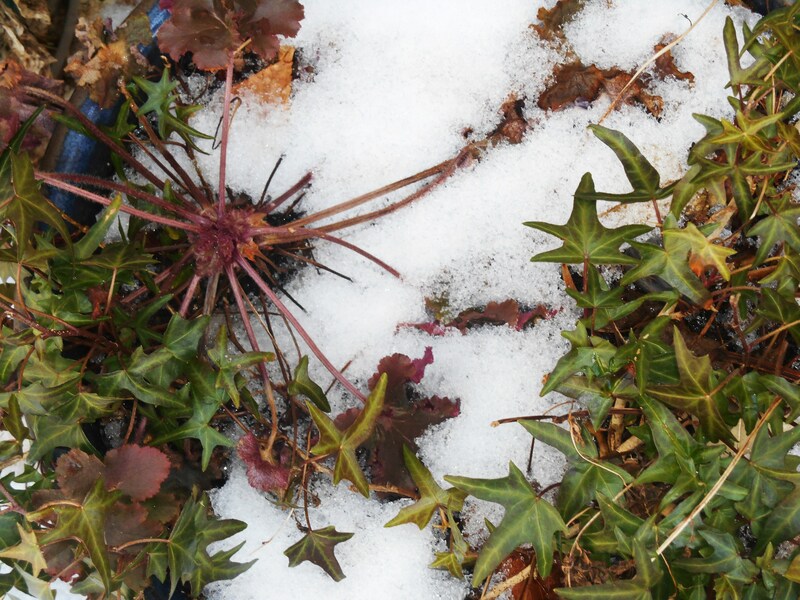 Our extended periods of snow this winter help those plants which need the cold as part of their annual pattern of growth. We humans are extremely adaptable, and stubbornly tough. We find work-arounds for all sorts of frustrating circumstances. We will deal with this coming winter storm, and the next, and will learn some useful life lessons in the process. May spring find you sane, healthy and soon. But until this winter passes, please remember to stop to appreciate the beauty of it all. And keep in mind that snow brings its blessings along with its frustrations.